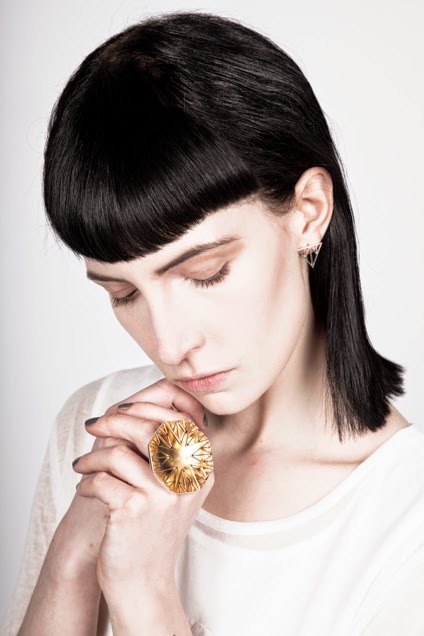 Repetitive layers, mathematical possibilities and geometry represent the core foundations of Monique Daniels jewellery collections. 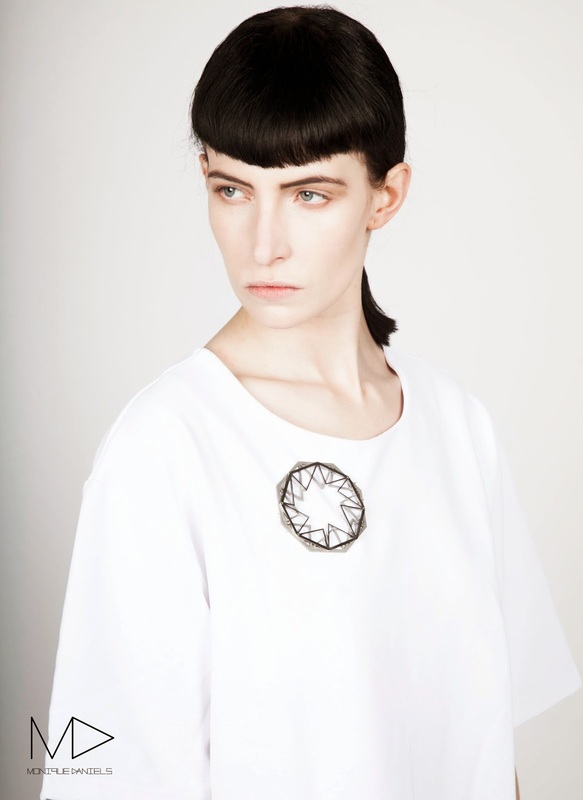 She utilises traditional jewellery making techniques with precision cutting technology to create a futuristic yet fashionable adornment for forward thinking modern women. Intrigued by the complex and dynamic aesthetics, I delve deeper into the mind of an analytical artist/jeweller. 1. What is the inspiration behind your latest collection Hazael? I draw my inspiration from many forms, I am influenced by mathematics and astrology along with my personal style. The Hazael collection was also inspired by the Hebrew name ‘Hazael’ which was discovered in my family tree. 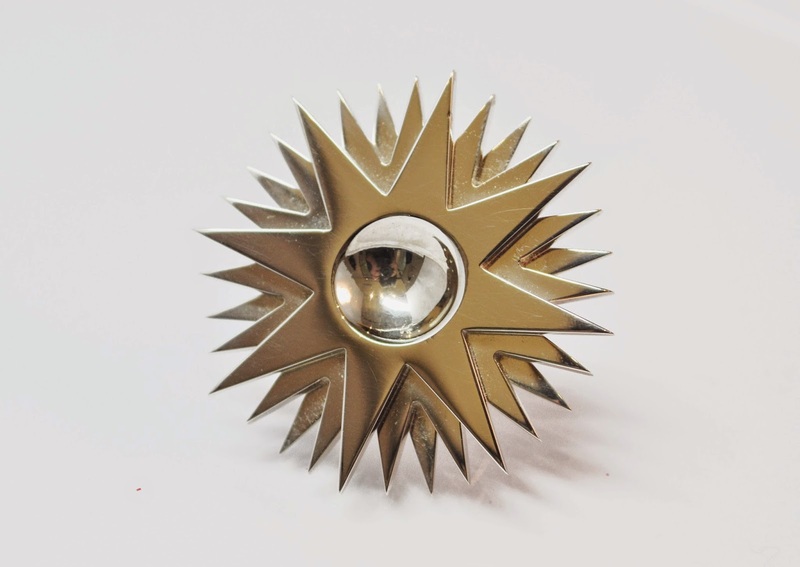 In researching this I found the name originated from King Hazael of Damascus who owned triangular weaponry -which went hand in hand with my designing of the collection. 2. 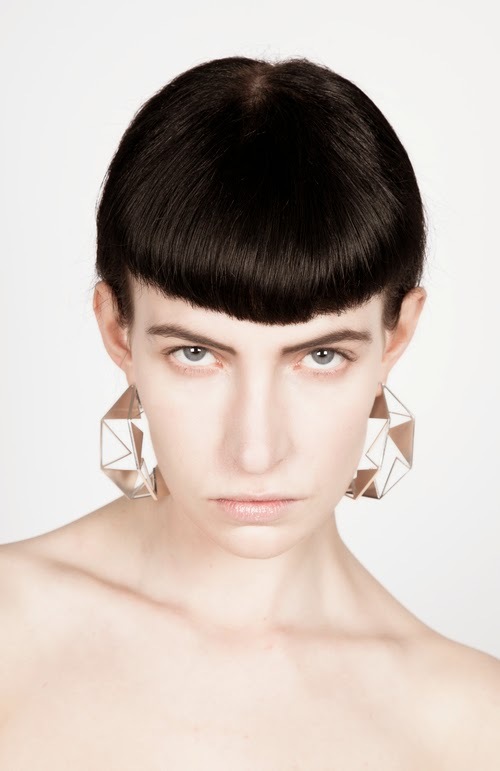 Geometry is thoroughly explored in jewellery. Can you explain on a personal level why this thematic concept is so popular? I use geometry in my work as it symbolizes strength and power. I think the clean lines and modern themes of geometry will always have an appeal within design. 3. You're currently based in Goldsmiths' Centre and part of the Setting Out programme. What are the benefits of the residency for young designers such as yourself? The Setting Out Programme has allowed me to expand my brand with business support and facilities on hand in amazing workshop space. Having The Goldsmiths’ Centre as my base has been a fantastic opportunity for me to establish myself. 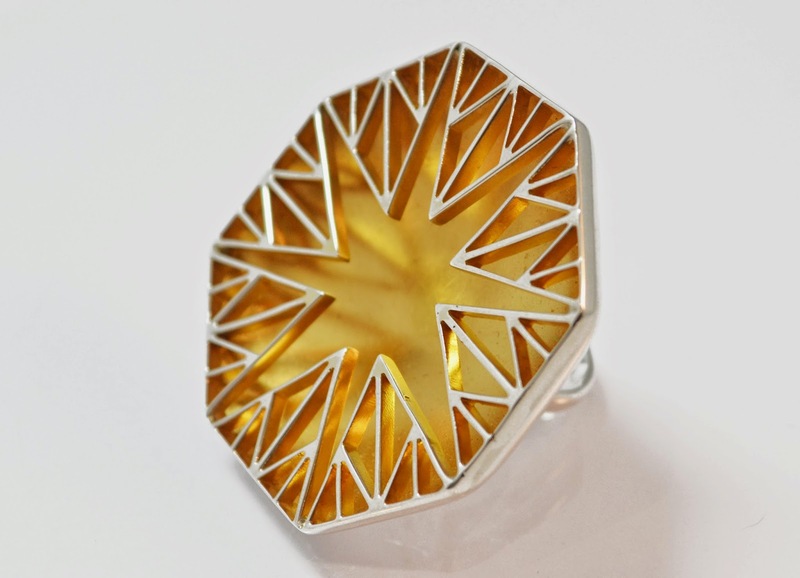 This year I will be exhibiting some pieces alongside my fellow Setting Out Programme designers at Goldsmiths’ Fair on The Goldsmiths’ Centre stand which is very exciting. 4. 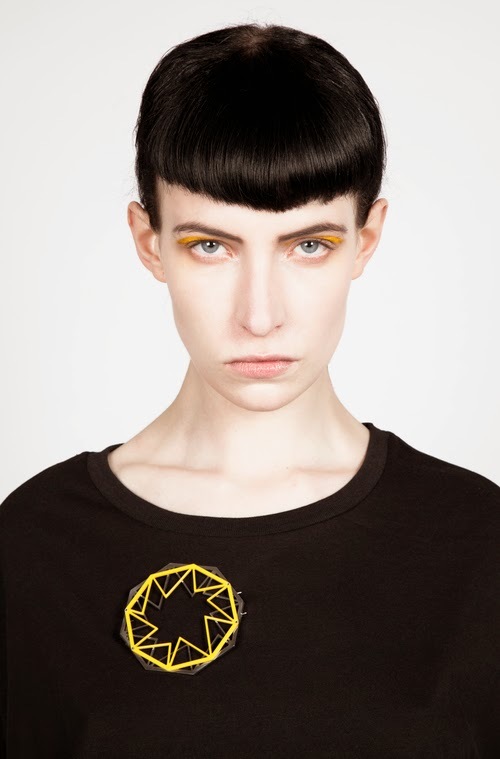 Describe the transition/evolvement you've made from your debut collection Astro to the Polyhedra collection. How do you create a collection that has a connection yet different at the same time? The connection comes from my design style and signature aesthetic. The collections evolve as natural progression, it’s a development which I have carried my personal style through. Astro was bold with intricate structures on a smaller scale, Polyhedra was developed through changing scale and rotation but still having that individual signature as reference. 5. What is your favourite piece of jewellery at the moment. From your own collection and from your fellow jewellery designer/s? As the first piece I made from the first collection, I do have a soft spot for my Astro ring. However I do believe a favourite piece should be the piece just started. That feeling of start to completion is really exciting. I love all of Grima’s work, stunning and timeless. I love what Shimell & Madden are doing too. 6. If you're not making jewellery how do you relax in your spare time? I think being self-employed in a creative industry you never fully switch off. You can draw inspiration from thing around you, and having the responsibility to run a business is hard work but I wouldn’t change it. 7. Describe the creative and technical stages of making your jewellery pieces. What is the hardest and most enjoyable part of the process? For me it is dependent on the piece. I will usually design by drawing, then taking it into computer design where I can distort and repeat. I use a variety of technical processes, but I will always create a model- be it laser cut or 3d printing, it is fundamental in design to test the piece and make any changes. The hardest part is in the workshop, working late into the night. Working so hard your fingertips are bleeding! But then the euphoria of finishing that piece, seeing your design in reality and seeing it worn is the best feeling and makes it all worthwhile. 8. 5 words to describe your jewellery. Arithmetical, complex, dynamic, contemporary, precise. 9. If you could collaborate with anyone who will it be? And why? The artist Conrad Shawcross. I am a big fan of his work – particularly his ‘Plosion’ series and ‘Perimeter Study’ arrangements. It would be amazing to translate my work into large scale sculpture and is something I hope to achieve in the future.